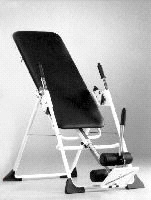 Master Care Swedish Design Back-A-Traction Home Inversion Back Therapy Table (WHITE w/ BLACK PADDING). Swedish innovation and luxuriant quality, designed to accommodate users seeking the gentlest measures of effective therapy. Heal without stress! 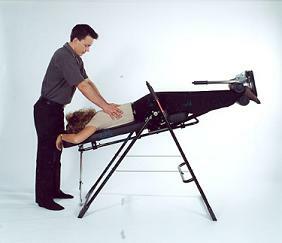 The Swedish-made, residential-grade CN-B1 is designed for stress-free inversion therapy for those seeking extra comfort and reassurance. The B1 features rugged steel tubing, double-locking safety catches, pivot arms with a stop mechanism, manual controls, and a sliding backrest for superb, safe adjustability. The backboard and frame are black and can be easily and attractively added to the home or office. Especially beneficial for those with comfort sensitivities, the CN-B1 is made of steel tubing that uses manual controls to accomplish inversion. Maximum user weight of 330 pounds. Self-locking foot restraint adds extra security. 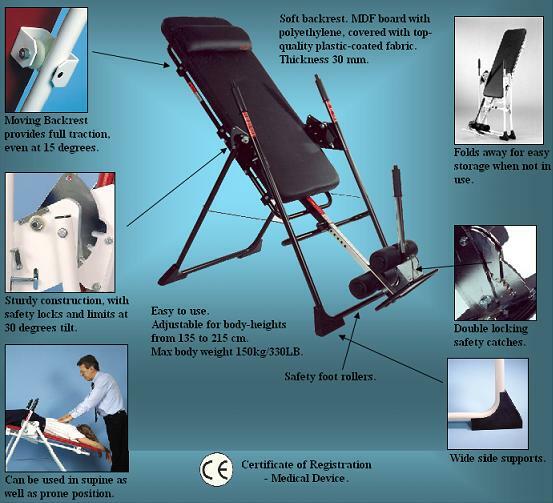 If you have any questions regarding this inversion table please give us a call at (800)355-2956. - Adjustable for body-heights 4' 6" to 7' 2"